There is a lot of difference when we play a game with normal mouse and with a professional gaming mouse. Using a professional gaming mouse is always an added advantage when you play online. Specially for games like Dota, Counter Strike, Modern Warfare and Other Online shooting games. Usually a normal mouse will have 4 to 5 buttons to navigate your operating system and to play games. But when you use a special gaming mouse, you can assign 20 to 25 keys in your mouse itself with different profiles. Each of these key will play a prominent role when you play a game. Specially when you are playing online. Most of the opponents in online gaming are very tough to challenge. So, If you want to compete them, you should have your own unique gaming gear. When it comes to gaming mouse, you have to very specific in selecting one. There are a lot of things which you have to take into consideration. You can find a huge difference when you play with a gaming mouse, you can feel the way you play is far better when you play with a normal PC mouse. You can find your way of playing has tremendously improved. Seeing this interest in Online PC gaming, we have made a list of Top 5 gaming mouse models from Steel Series. Each of these mice will have their own ability. So, what are you waiting for ? Here goes the list of Top 5 PC gaming mouse/mice. 1) SteelSeries Sensei Fnatic: This mouse features illumination options, amazing design,ability to save different profiles on board, LED panel to customize the mouse. This special edition mouse was designed by an award winning professional gaming team called Fnatic. With Sensei in your hand, you can actually feel the DNA of winning any game you play. It features highly sophisticated firmware which allows you to adjust the sensor functionality. User can also customize the mouse according to his desires. This amazing Special edition Sensei mouse comes with a price tag of €99.99 which is around Rs: 7,000. Whereas the normal SteelSeries Sensei gaming mouse comes for €89.99 which is around Rs:6300 INR. 2) World of Warcraft® Cataclysm™ MMO Gaming Mouse: This amazing gaming mouse was specially designed for World of Warcraft. This gaming mouse provides remarkable benefits to all MMO gamers, regardless of their play style or level. This mouse features incredible customization options to accommodate personal preferences. World of Warcraft® Cataclysm™ MMO Gaming Mouse has some special features like, it has 16 million illumination choices with 3 intensity and pulsation levels, More than 130 predefined commands for drag and drop macro creation, You can save up to 10 different profiles in armory and 1 profile directly on mouse, Total of 14 programmable buttons, and Compatible with Mac and PC with HD laser sensor technology. 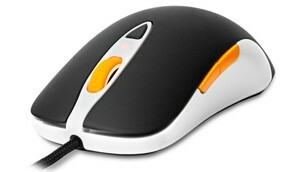 The price of this amazing gaming mouse is €89.99 which is round Rs: 6300 INR. You can also find another gaming mouse in this category called SteelSeries World of Warcraft® MMO Legendary Edition which comes for €69.99 (Rs:4999 INR). 3) SteelSeries iron.lady Ikari Laser Bundle: This mouse is the result of 15 months extensive research of ergonomics, technology, motion, shape, hand grip and play styles by gamers. The specifications of this amazing gaming mice are based on the inputs given by professional gamers from Team 3D, compLexity, mousesports, Team NoA, SK Gaming and other top class gaming organizations who represent Counter Strike and other top class games. This mouse has some amazing features like, Programmable macro buttons with driverless plug and play feature, 40,000 sample per second for unbeatable tracking, 1-3200 changeable in increments of one, Built in LCD display to help set CPI values on the fly, chassis material and shape based on input from top class professional gamers. This mouse comes with a price tag of €84.99 which is around Rs: 5450. You can also find few other amazing gaming mouses in this model. They are SteelSeries Ikari Laser White for €69.99, SteelSeries Ikari Laser for €69.99 and SteelSeries Ikari Optical for €49.99. 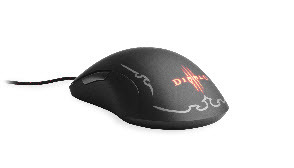 4) SteelSeries Diablo® III Mouse: Diablo III mouse is specifically designed to withstand the rapid click punishment of the game. It promises a guaranteed lifespan of 10 million clicks which is more than 3x the click lifespan of an average mouse. Diablo III is featured with 7 ergonomically place buttons and an amazing shape. It is enhanced with demon red illumination on 3 areas on the mouse. The scroll wheel, CPI indicator and Diablo III logo are just amazing. Players can also customize the logo with ON/OFF illumination and 4 levels of pulsation. The players can drag and drop Diablo III themed interface with pre-defined skills, game commands and the ability to quickly remap all the 7 mouse buttons. This mouse is compatible with both Mac and PC. The rubberized black grip coating of this mouse is accompanied by demon red illumination which looks amazing when connected. This amazing gaming mouse comes with a price tag of €69.99 around Rs: 4900 INR. 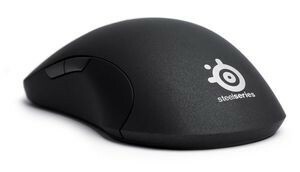 5) SteelSeries Xai Laser: This amazing SteelSeries Xai is not a gadget, its an amazing tool. The technology, shape, weight, size and surface of this gaming mouse is designed by USA, Europe, Asia professional gamers. The sensor offers huge improvement over current laser mice. it has 12,000 processing frames per second at movement speed of 150+ inches per second. This level of performance results in complete reliable tracking even during the most fast paced games. It has few amazing features like Programmable macro buttons, automatic lift distance, driverless plug and play, amazing ambidextrous shape, SteelSeries free move, Menu system on mouse, Exact rate, exact aim. This mouse comes with a price tag of €79.99 which is around Rs: 5600 INR. If you are looking for an amazing gaming mouse with good features at an affordable price, then Steel Series is your choice. You can find more amazing mice, keyboards and headset gaming gears in their official online shop. Check them out and get your own gaming gear. Please leave a comment below incase you have any suggestions related to this Top 5 gaming mouse post. The SteelSeries iron.lady Ikari Laser Bundle!